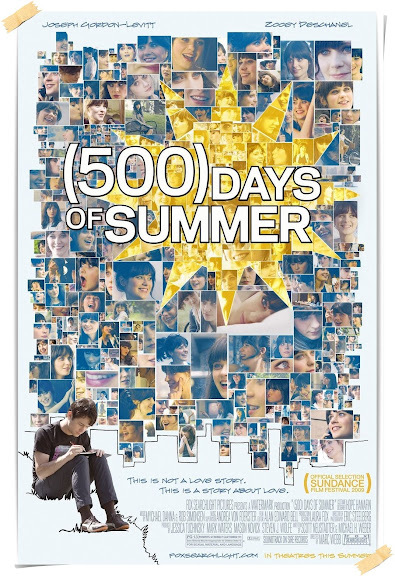 Christopher and I attended the free screening of (500) Days of Summer last week and in exchange gave a voluntary micro-review to the movie company Fox Searchlight through either facebook or twitter. I chose the twitter route and sought to write the review as a haiku thinking the 140 character twitter limit and 5-7-5 syllable haiku structure would save me time, but it turned out to be quite hard as it is with anything well-edited. Below are our final haiku reviews. I highly recommend seeing this movie and buying the soundtrack right away. See my previous posting on the soundtrack and free screenings here. There are two great songs for today that are integrated well into this movie ~ beautiful pieces from Carla Bruni, also well known as the wife to French President Nicolas Sarkozy, and Regina Spektor.